Bollard light Rimbo with IP65 protection certificate to protect it from dust and water. Ideal for lighting roads, gardens... The main structure is made of chromed metal and the lampshade of polyethylene. Lighting with E27 bulb (not included).Dimensions: High 99 cm. Long 40 cm. Bollard light Rimbo with IP65 certification to protect it against dust and water. Ideal to light up gardens, paths... and give them a modern and current style. It is made of stainless steel and the lampshade of polyethylene in white.Dimensions: High 34 cm. Long 40 cm. Ceiling lamp Pam with LED lighting integrated of 16 W. You can regulate the light intensity according to your needs. Design by Jordi Jané, with a dish shaped lampshade formed by metal sheets finished in two colors: white or reddish copper. Adjustable height.Dimensions: High 130 cm. Diameter 50.3 cm. Pendant lamp with LED Lighting of 7W. 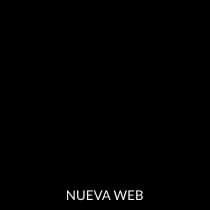 Stands out he modern and original design made by Jordi Jané stands out. The structure of the lamp is made of injected aluminum and also has four finishes: white, gray with interior gold, copper or gold. It is an ideal lamp for living rooms, bedrooms or even premises.Dimensions: Maximum height 130 cm. Diameter 11.3 cm. Ceiling lamp with LED lighting built-in of 33 W (warm light), the most efficient lighting technology of the market. It has a lampshade designed in the shape of a plate, available in three finishes: textured white, lacquered marengo grey or copper lacquered Also available in gold finish. Consult for more information.Dimensions: High 290 cm. Diameter 60 cm. Ceiling lamp Tub with LED lighting integrated and adjustable intensity. Power of 4 W and warm light. Cylindrical design and stainless steel construction. Ideal to light with a minimalist touch and contemporary rooms such as the living room, dining room... Also available in white finish. Ask for more information.Dimensions: High 130 cm. Long 4 cm. Ceiling light Kronn of modern style with two superimposed points of light that you can turn and move at an angle of up to 300 degrees. Lighting with two GU10 bulbs (not included). Availability in chrome or white finish. It is ideal to light all kinds of rooms: dining rooms, living rooms, bedrooms etc.Dimensions: High 20.6 cm. Diameter 14.5 cm. 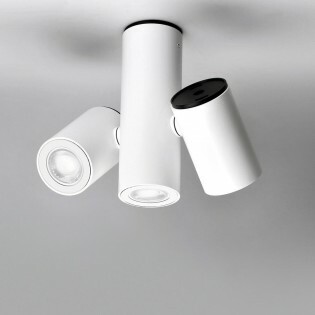 Ceiling light Kronn with three lighting points designed in the shape of an elongated tube and placed in different positions. 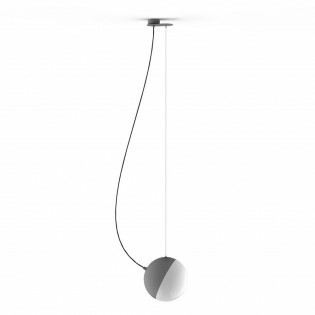 It has a rotation angle and opening degree of 300º so that you place each light in the position that you want. Manufactured in zamak and finished in white or chrome. Possibility to choose.Dimensions: High 20.6 cm. Diameter 22 cm. Ceiling light Kupp with cylindrical design, structure made of polycarbonate and polymethyl methacrylate lampshade. Finished in chrome. Its discreet size and minimalist style is perfect to light up rooms such as the living room, dining room, hallway, kitchen etc. Dimensions: High 16.7 cm. Diameter 6.2 cm. Ceiling light Kupp with two light points of beautiful design made of polycarbonate and polymethylmetacrylate with chrome finish. The two lights have a cylindrical design. The minimalist and modern style of this lamp is perfect to give a beautiful lighting to dining rooms, living rooms, corridors etc.Dimensions: High 19.2 cm. Diameter 12.2 cm. Ceiling light Kupp composed of three light points made of polycarbonate and polymethyl methacrylate lampshade. Finished in chrome. Perfect to light up with a minimalist and contemporary style such as the dining room, living room, bedroom etc.Dimensions: High 21.7 cm. Diameter 12.2 cm. Ceiling light LED Dau of 4 W and adjustable intensity. Its small size and the originality of its design, with cube shape, make it ideal to light up rooms of modern and minimalist style. Available in white or chrome. 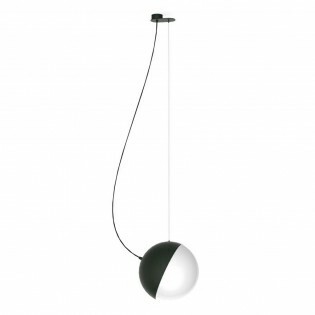 Ideal for placing in composition with several lamps together in corridors.Dimensions: High 6 cm. Diameter 5 cm. 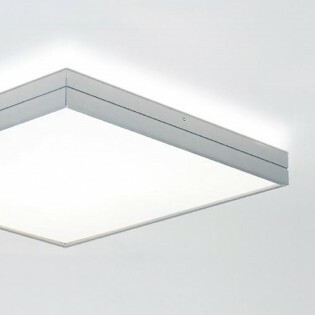 Ceiling light designed by Stefan Kärhs with structure in square shape made of satin glass. Includes LED light with 16 W power, warm and adjustable light intensity. Ideal for lighting rooms such as the kitchen, living room...Dimensions: High 7,4 cm. Long 30 cm. Width 30 cm. 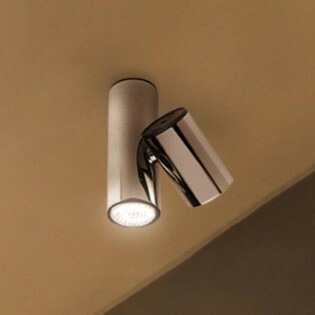 Ceiling light with LED lighting adjustable in intensity and finished in stainless steel or white. Two models to choose. It has three lighting points that you can direct to your liking (angle of rotation of 320º and opening of 180º). Ideal to light up your home with a modern touch.Dimensions: High 12.3 cm. Long 13 cm. Ceiling light with two lighting point LED, 4 W each (possibility to adjust the intensity). Tube-shaped design, fabrication of stainless steel and two finishes available: white or aluminium. You can adjust the angle of rotation (320º) and opening (180º) to direct the light accurately.Dimensions: High 12.4 cm. Long 8.5 cm. Ceiling light led designed by Jordi Jané. Modern Ceiling light, square design with several satin glass levels and chrome-plated metal sconces. Homogeneous lighting effect. Perfect for corridors, living rooms, bedrooms and other rooms with modern decor.Dimensions: High 7.8 cm. Width 32 cm Length 32 cm. Ceiling light led designed by Jordi Jané. Modern square design ceiling light with several levels of satin glass and chrome plated metal sconces. Homogeneous lighting effect. Perfect for corridors, living rooms, bedrooms and other rooms with modern decor.Dimensions: High 7.8 cm. Width 39 cm. Long 39 cm. 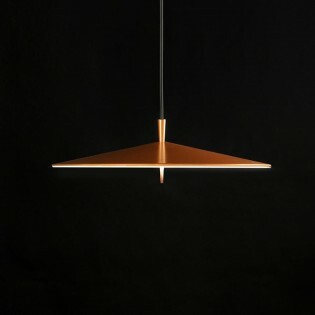 Ceiling light designed by Jordi Jané, led high power and minimalist design. 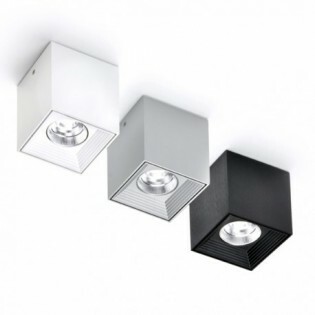 With 4 adjustable led spotlights arranged in a square shape, white lacquered finish. Perfect for corridors, shops, lounges, bedrooms, etc. of all styles.Dimensions: High 7.1 cm. Width 47 cm. Long 47 cm. Ceiling light Tub, modern style with integrated LED light of 11 watts (warm light) and adjustable intensity. It is composed of metal ring and cylindrical lampshade made of white satin glass. To light any type of room perfectly.Dimensions: High 2.8 cm. Long 12 cm. Ceiling light Tub with LED lighting of 4 W, circular base (drill 6 x 6 cm), finished in stainless steel or white. You can configure its position at a 90º angle and turn it up to 300º. Ideal to light up specific areas of your home. Dimensions: High 13.4 cm. Long 8.5 cm. Ceiling light modern very small with circular structure made of aluminium and interior lampshade with cylindrical design made of white opal glass. Lighting with G9 bulb (not included). Ideal for placing in corridors or entraces.Dimensions: High 7.7 cm. Long 10.8 cm. Surface Ceiling light designed by Jordi Jané, high power and with careful cube shape and matched colors: satin aluminum, black, white-black lacquered. Perfect for compositions in corridors, commercial premises, lounges, bedrooms, etc. with modern design.Dimensions: High 9 cm. Width 8 cm. Long 8 cm. Ceiling light Polifemo of Modern style. It has a square design, manufacture of aluminium and available in grey or white finish. To light up rooms such as the living room, dining room, bedroom, kitchen etc.Dimensions: High 7.6 cm. Long 20 cm. Width 20 cm. Ceiling light of the Polifemo Collection with two lighting points. It has a rectangular shape with a clean and modern design made of aluminum and finished in grey or white. Two models to choose. Ideal for lighting rooms such as the kitchen, living room, bedroom etc.Dimensions: High 7.6 cm. Long 39 cm. Width 27 cm. 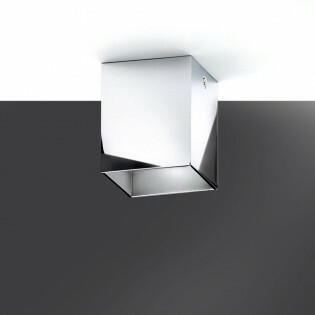 Ceiling light of the Polifemo Collection, made of aluminium with square design and available in grey or white. Four lighting points. Ideal for corridors, living rooms, bedrooms, offices... Lighting with four GU10 bulbs (not included).Dimensions: High 7.6 cm. Long 45 cm. Width 45 cm. Ceiling lamp with black exterior and golden interior. The contrast of these two colours of the Raindrops lamp is simply perfect, ideal for use in living rooms, on dining tables and bedrooms. It has 18 decorative glass tears that reflect light to create a unique lighting effect. Dimensions: Max. height 300 cm. Diameter 40 cm. Ceiling light Rimbo with ceiling support made of chromed metal and lampshade made of white polyethylene with oval design. A design of modern and minimalist style perfect for corridors, kitchens, dining rooms...Dimensions: High 19.3 cm. Long 40 cm.